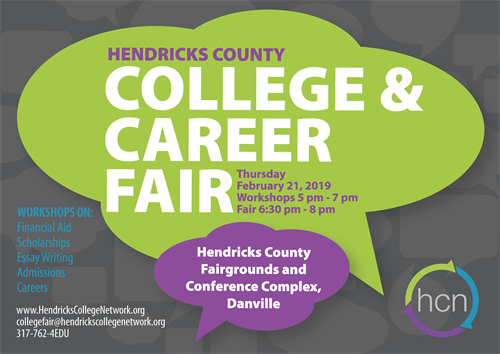 If college, a new career, or learning new skills are in your future, then come to the Hendricks County College and Career Fair on Thursday, February 21 at the Hendricks County 4-H Fairgrounds in Danville, IN. This is THE COLLEGE FAIR in Hendricks County, and participants from all parts of the county are encouraged to attend. Workshops begin at 5:00pm, and the fair runs 6:30-8 pm. In 2018 over 400 people took the next step to further their education or career. In addition to the 100+ colleges, universities, trade schools, military programs, and career organizations that will be represented in the fair, workshops on scholarships, financial aid and more are scheduled at 5 and 6pm. There will be 20+ Adult Programs offering information to assist local residents in their quest to further their education, improve their employment opportunities, and achieve personal fulfillment. There will also be professionals to answer your questions about different career opportunities! For more information, contact Hendricks College Network at 317-762-4338 or visit www.HendricksCollegeNetwork.org.